Note: This text first appeared at GENETIKOMM. Communication and change have been historically linked to each other. PR and Communication professionals are very much used to creating narratives and strategies that intend to introduce new products, services or ideas to target audiences. We know how to look for angles and hooks that will work with a specific group of people. We have tools and methodologies to reach and move the masses. And we take a lot of effort in showing our superiors and clients the positive results of our efforts. When dealing with change, success will be measured in the levels of positive and negative emotions towards that change. Especially in crisis situations, we make it our utmost priority to contain anger, questioning, or revolt. Now, all organisations (and countries, if I may add) go through change. They face appointments and lay-offs, restructuring, acquisitions, mergers, takeovers, reputation issues involving products, finances, changing markets, technological disruption, new competitors, exponential growth and “deceleration”… to name just a few. Commit to the new direction. Most non-Forbes 500 companies do not see their change (or crisis) communications as a strategic matter. They will only allocate resources to managing crisis when external events propel them to do so. When that happens, not only do they spend an enormous amount of money on contingency, they also put their C-level management under a tremendous amount of stress. Is this avoidable? Of course it is. In that sense, preparing for communication around change and investing in crisis protocols is always recommendable. But there is more. As communicators, we do not need to sit and wait for change to happen before we take action. We can become an active part of it, accompanying and promoting the “good change” within our organisations, instead of focussing on “neutralising the bad one”. In order to do so, we have to shift our approach, become more proactive and, even if it may sound contradictory, less active: we need to listen more, and talk less. An organisation’s communication is a whole that combines vertical (hierarchical), horizontal (formal and informal) and viral (spontaneous) communications. As we like to say at Genetikomm, organsations are spherical. Although the organisation does not “control” the entire message flow, it can be an active part of it. Language is a reflection of one’s world view. The words we use are part of and as such, partially describe, metaphors for how we perceive and evaluate people and situations. Descriptions and adjectives are not “good or bad”, “positive or negative”, they are merely more or less aligned with the ones we ourselves or the organisation would use. The idea of change generates resistance. It is a lot easier to introduce new products, services or ideas when instead of focussing on how to package what we want them to know, we learn to speak our audience’s language and use their world view as an anchor point for the new. Communication is in essence, a dialogue. We need to listen at least as much as we talk. Change is an ongoing process, not a moment in time. Long before visible change occurs, it has started underneath the surface (before we detect the first grey hairs in the mirror, our hair follicles have started to mutate). 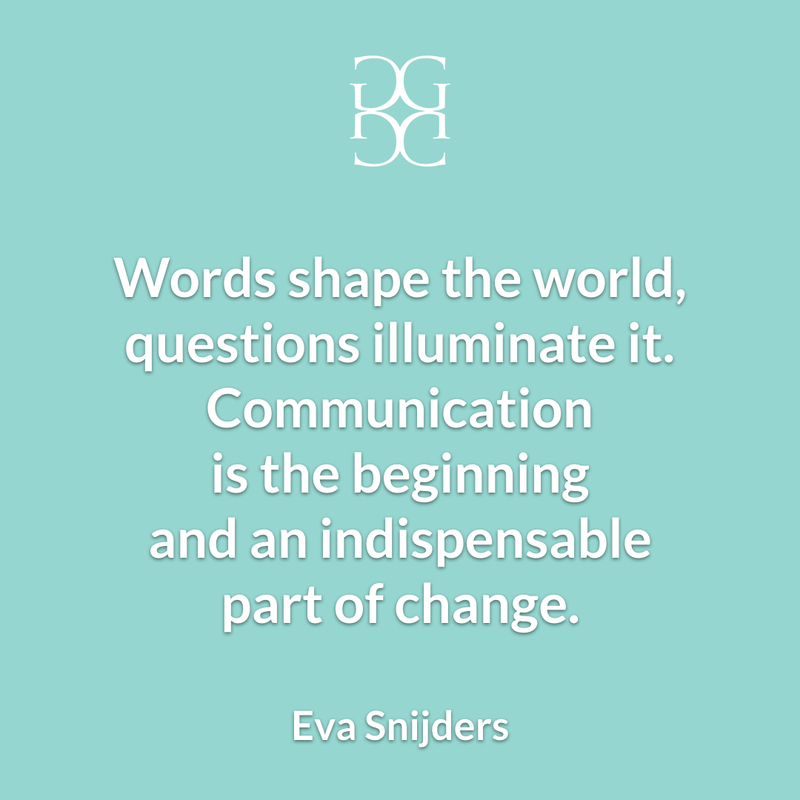 As we establish a sincere dialogue, posing new questions that explore, clarify and open up room for new ideas, we, as communicators, become an active part of the change process.